U.S. Embassy Technology Event November 7 at the Residence of the U.S. 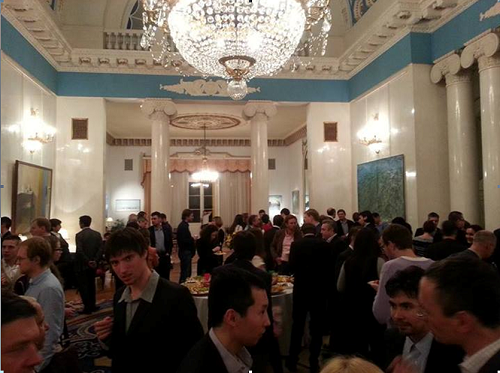 Ambassador, Spaso House. Russian tech companies and venture capital investors the opportunity to understand the advantages of investing and conducting business in the U.S., hear from tax and legal subject-matter experts, receive a resource guide for technologies companies interested in opening an office in the U.S., and meet with Russian firms who have already launched successful operations in the U.S.
SelectUSA is the lead United States government effort to facilitate business investment in the United States and can serve as a starting point for all of your business investment needs. Additionally, SelectUSA offers an Ombudsman service that can help resolve issues that may arise involving federal regulations, rules, programs, or activities related to existing, pending and potential investments. Overview: This event will provide Russian tech companies and venture capital investors the opportunity to understand the advantages of investing and conducting business in the U.S., hear from tax and legal subject-matter experts, receive a resource guide for technologies companies interested in opening an office in the U.S., and meet with Russian firms who have already launched successful operations in the U.S. Objective: To discuss desirability of doing business in U.S. for Russian technology companies, and provide how-to advice on conducting business operations in the U.S. Operations can include incorporation in the U.S., capital raising activities, R&D, etc. Audience: people from Russian Venture Capital firms representing technology companies that have already received tier one or tier two level financing and are looking to expand the growth potential of these companies by expending into the U.S. market. Key management and investors in these Russian technology firms will also attend.